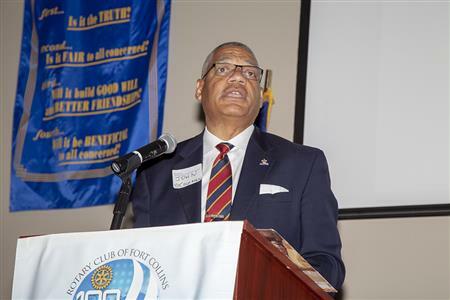 Last week John L Coleman, Jr., CEO of Boy Scouts of American, Long Peaks Council, spoke on the "Evolution of Scouting". The audience included many former Boy Scouts, Girl Scouts and one Eagle Scout. Coleman was introduced by BSA LPC Development Director Dawn T-Baumgartner. There are currently 2.3 million scouts including over 10,000 in our region. The big news is the start of "Family Scouting", currently available in the Cub Scout age range (K-5) and starting next year, available to ages 11-18. John addressed some of the misunderstandings regarding changes (eg, this is not a "co-ed" organization but separate and equal activities for both genders i.e., dens are all male or all female). This new concept is apparently well-accepted as indicated by the number of girls and women signing up. A bit of BSA's history was shared. Rotary was congratulated for it's BSA support (Paul Harris was a highly decorated scout). The values and goals of scouting remain unchanged - character building, leadership skills, service to the community - to name a few. A recent focus has been to target recruitment to multicultural, underserved communities. Scouting's focus on the outdoor experience for youth from all socioeconomic levels has become more important in this age of electronics. Finally we saw pictures of the many local Scouting facilities starting with Red Feather Scout Ranch (many of our members were familiar with this site). The evolving organization will continue it's mission and teach values which remain as pertinent today as they did almost 108 years ago. The question and answer time provided excellent expansion of today's presentation.